With about 600 million users on Facebook now, it’s no longer just a social network. It’s now a utility. Something you need … water, heat, trash removal and Facebook. I know it sounds funny, but as the owner of an online-only business where facebook is my largest link referral (second only to Google) I do see it as a necessity. It also helps me find clients and new hires at Cincy Chic. Several of our interns have been from listings we post on our Facebook page. With that said, it always boggles my mind when people have a cruddy profile picture. Really? More people probably see this photo in a day than see your REAL face in REAL life. This is what people use to see if they should hire you, friend you, or “like” you, so it should be one heck of a good photo. I recently read this funny article about the five profile photos that make you look like a tool. The list included “group photo,” “photo of you drinking,” “picture of your dog,” “picture of your baby,” or my favorite “random inanimate object.” I would also add “super blurry photo” or “too small to even see photo” to that list. So, if you’re thinking “wow, I really need to update my profile pic” after reading this, I have a great event for you to attend. I just got this email from Saks inviting me to come. Unfortunately, I can’t go because we’re having our Cincy Chic anniversary party that night (yay! we’re four years old! ), but hopefully you can go! 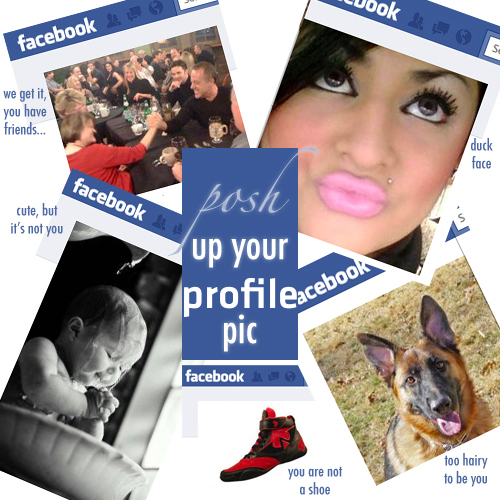 Especially if your profile pic needs some poshing up! Your Beauty. Your Style. Your Profile. Need a great photo for your social network page, website or blog? Come to Estee Lauder for a great complimentary makeover with our experts. Then we’ll take your photo and even help you post it online, if you wish. Put your best face in cyberspace and get a 10-day supply of foundation. It’s easy. It’s fun. It’s free. Also, enter to win Harper’s Bazaar’s “Fabulous At Every Age” Contest. Visit harpersbazaar.com/fabcontest for Official Rules. To book your appointment, please call 513.421.6800, ext. 362. So, in a nutshell, you come in for a complimentary makeover and a headshot. We will have a photographer and a re-toucher on hand to insure that you look your very best! You will be able to upload your photo to any social networking site or email the jpeg to yourself and you get a 5×7 headshot.